AT&T and Verizon both make great high-yielding, defensive investments with potentially improving growth prospects. Verizon Communications (NYSE:VZ) and AT&T (NYSE:T) operate as a duopoly in the United States, enjoying their status as "cash cows." Growth has slowed since the days of the smartphone boom, however. Both companies have also underperformed the market this year. Most investors buy these stocks solely for yield, but should they? AT&T offers a dividend yielding over 5%, compared to Verizon's yield of around 4.30%. Telecommunications companies tend to pay dividends out of free cash flow, so that's the metric that's probably best to look at to determine the health of these dividends. Last quarter, AT&T revealed it's expecting around $11 billion in free cash flow for both this year and 2015, as it continues to invest in its network. The company paid nearly $10 billion in dividends over the past year. The company's CEO also indicated that 2014 would be a "peak year" for VIP spending, so CapEx could also be a tailwind starting next year. This should open up more free cash flow to shareholders. Verizon's situation is more unique, due to its recent deal with Vodafone (NASDAQ:VOD). Verizon reported around $3 billion in free cash flow during its most recent quarter. This was higher by $1 billion year-over-year, and largely attributed to the extra free cash flow the company gets to keep after buying out the remaining 45% of Verizon Wireless from Vodafone. To sum things up, both telecoms pay out relatively safe, sustainable dividends. These dividends are both high-yielding, and while AT&T currently gets the slight edge, Verizon's dividend may grow at a faster pace going forward. But what am I paying for the dividends? Both Verizon and AT&T are currently valued around 10-11 times trailing twelve month earnings. 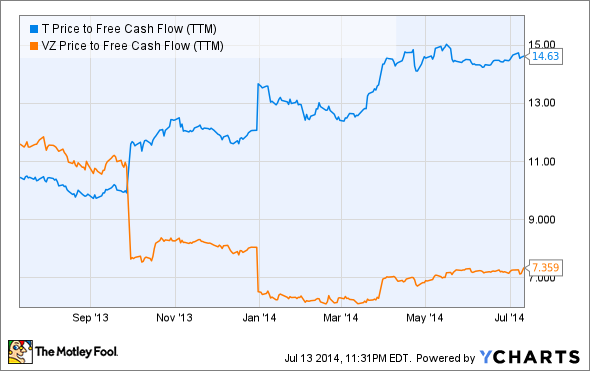 Verizon is much cheaper when looking at its price in relation to its free cash flow, however. Valuation-wise, Verizon wins this battle. "The combination of Vodafone and Cobra will create a new global provider of connected car services... We plan to invest in the business to offer our automotive and insurance customers a full range of telematics services." It's also no surprise that Verizon and AT&T are also getting into this lucrative future growth market. The number of Internet-connected cars is expected to grow sixfold by 2020, and Verizon has already struck deals with Toyota, Mercedes Benz, Hyundai, and Kia Motors to provide services such as infotainment and remote vehicle diagnostics. During its last quarter, Verizon's telematics and M2M revenues saw growth in excess of 40%. AT&T also inked deals with Tesla, Audi, and General Motors. The connected-car is only one subset of a burgeoning wave of connected devices. The Internet-of-Things, or IoT, will connect most physical devices to the Internet, which in turn will generate massive amounts of data usage for both U.S. telecoms to feed off of for growth. Gartner expects the IoT market to grow to 26 billion units by 2020, excluding things like Tablets and PCs, while also adding trillions of dollars to the global economy. Both AT&T and Verizon offer above-average yields and are positioning for what could be a very lucrative growth market down the road with the IoT. An injection of solid growth into these companies could potentially shift the market's perception of them as slow-growing bond substitutes. This is why I think that these companies should be considered as investments in the future of the Internet, as opposed to stocks bought only for yield. In the meantime, both companies currently trade at a discount to the overall market. Why not own both? Sometimes the best offense is a good defense, and both of these companies make good defensive investments for your portfolio in today's market environment. They will likely even have a growth spurt coming over the next few years as well. I tend to focus more on value than growth, but stocks that tie in both are my favorites. I really like dividends, too. Follow me on Twitter @JosephHarry87 or stop by http://www.anti-icarus.com for more investing ideas.